CREW LONG PADSTOW PIQUE SWEATSHIRT IN WASHEDNAVY/WHITE. CREW CLOTHING. MACHINE WASH.
Unworn Helas Long Sleeve Rugby Polo - Caps Flamingo - RRP£62 - Large. Dispatched with Royal Mail 1st Class. Unwanted gift - doesn’t fit me. Unworn. Kent & Curwen David Beckham Union Jack Rugby Shirt Cotton size XL. Condition is New with tags. Dispatched with Royal Mail 2nd Class. Navy & pink quarters. Size is XL. Pit to pit 27". Rugby Style Shirt L or XL - Brand new in pack. Colour is Burgundy (Plum?). 2nd photo makes it look black but it is burgundy only. Sizes available: Large (42/44 chest) or XL (46/48 chest). Ideal for Sports, Leisure or Work. MENS JOULES "LIONS V BARBARIANS" LONG SLEEVE COTTON RUGBY SHIRT. LARGE. FOR SALE, MY JOULES RUGBY SHIRT. I BOUGHT THIS AT A JOULES OUTLET IN MARCH THIS YEAR IN A SALE FOR £39.95 (RECEIPT INCLUDED). Navy with pink collar. Collar to hem 34". Size is XL. Underarm 21". Crew Clothing Mens Rugby Shirt XXL Light Mauve Used Condition. Condition is Used. Dispatched with Royal Mail 2nd Class. Crew Clothing Long Sleeved Blue Rugby Shirt Medium - Brand New With Tags!! Crew Clothing Long Sleeved Blue Rugby Shirt Medium - Brand New With Tags!!. Condition is New with tags. Dispatched with Royal Mail 1st Class. crew clothing Rugby shirt L blue and white good condition. Condition is Used. Dispatched with Royal Mail 1st Class. Condition is Us ed hardly be en w or n.
mens gant rugby shirt. Condition is Used. Dispatched with Royal Mail 1st Class. Ralph Lauren - Rugby Shirt -Custom Fit -100% Cotton -Size XL !! Ralph Lauren - Rugby Shirt -Custom Fit -100% Cotton -Size XL !!. Condition is Used. Dispatched with Royal Mail 2nd Class. Polo Ralph Lauren Iconic Rugby Shirt, Size Extra Large. Condition is like New. Worn once. Dispatched with Royal Mail 1st Class. Kenya Flag Rugby Polo Shirt Short Sleeved Tshirt By Airborne. Mens XL . Condition is New with tags. Dispatched with Royal Mail 2nd Class. Kenya Flag Logo Polo Shirt Black, Red & Green Mens XL Perfect for Rugby, football, casual Condition is NEW Kenyan Flag Colours Great Piping Accents in White 100% Cotton Made in Kenya Measurements: Chest: 21" Length: 25" Shoulders: 21" Sleeves: 8.5"
These shirts are high quality. This is a hardly used Ralph Lauren rugby shirt size L in excellent condition. I have washed it but only vaguely ironed it as there are too many to iron! They are all genuine no fakes. I have tried to show the patchwork on elbows. New without tags. De tagged but unworn. Ralph Lauren Rugby Shirt. only £14.99. Beige with white collars. Style with proud Union Jack on the back. Colour - Blue Mix Striped. Pit To Pit - 23" - 58.5 cm approx. 28" from the top of the shoulder to the back bottom - 71 Cm's Approx. Mens Superdry Valiant Rugby Jersey Polo Shirt L - brand new - never worn. 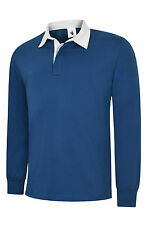 Mens Canterbury Medium Rugby Long Sleeve Shirt. Whether you're searching for a rugby shirt out of loyalty for your team of choice or simply like the style of these tops and want to add one to your wardrobe, you're sure to find the right shirt for you. Men's rugby shirts are available in a whole host of colours, designs and styles so you'll be able to pick the perfect one to match your preferences. Sometimes confused with polo shirts , rugby shirts are actually different in many ways. They will typically feature a broad horizontal stripe across the chest and the collar tends to be shorter and often stiffer. Whilst recreational rugby shirts may be made of similar, casual materials to polo shirts, those designed for sport will be harder wearing which is worth considering if you're looking for a top that will be more robust. Styles of men's rugby shirts can vary although most will have the main elements included fairly consistently, such as the stiff collar, buttons and the fact that they are more often than not short sleeved. If you are looking for a specific team shirt you'll find a wide variety to choose from, including both national rugby team shirts and regional designs as well as those with numbers marked on the back for real authenticity. Most styles are available in both short and long sleeved options with long sleeve rugby shirts offering a lot more warmth, making them perfect for the winter months. These are usually made from materials chosen specifically for their durability and breathability, such as heavy duty, high quality cotton. Official rugby shirts are made to withstand the tough conditions on the pitch and should last well in addition to being a very comfortable choice. Often associated with a more casual and preppy style, you can also find men's rugby shirts that have been designed for daily wear rather than to be worn exclusively for sport. Whilst these can be branded in line with specific team colours and logos they tend to be in regular colours and are popular in everything from pastel to bolder shades. Casual rugby shirts are available in a wider variety of materials including thinner cotton and cotton blends and can often be a more cost effective option. They can even be found in polyester and synthetic materials and in more snug fitting designs than traditional looser fit shirts, making them a good choice for smarter occasions.